Just a short note to mention one of our new favorite eco-friendly finds: natural wool insulation. Because our ceiling is covered in cedar T&G planks, we had the option of using wool fibers. While you can purchase natural wool in rolls similar to the traditional fiberglass insulation, using the unrolled wool was nearly half the cost and just as good. Hands down, wool is not only a completely recyclable, renewable resource, but it's one of the best insulators on the planet. In fact, after doing some research on the Internet, we were amazed at its additional perks, especially the ability to prevent condensation, breakdown indoor air pollutants and absorb sound. We ordered our wool from Oregon Shepherd. If you're interested, please check them out at: www.oregonshepherd.com. I copied some info from their site here. There are many natural insulation products available today, so why would you choose wool, or more specifically, Oregon Shepherd’s wool insulation products. Since 8,000 BC, sheep have been able to adapt to even the harshest of environments; their wool protects them through hot, cold, damp and dry seasons. Because of their crimped nature, when wool fiber is packed together, it forms millions of tiny air pockets which trap air, and in turn serves to keep warmth in during winter and out in the summer. The crimp in the wool fiber forces each strand to bump up against each other, as opposed to lining up side by side or laying down flat together. This keeps the tiny air pockets intact, acting as little insulators — the key to being able to keep you both warm and cool. The unique advantage of wool as an insulator is the NATURE of the fiber. It absorbs and desorbs moisture, it heats and cools as this process takes place. Wool therefore can absorb moisture in your house, preventing condensation. It has plastic memory, not that there is any plastic in wool, but rather that technical description is used to explain the “crimp”; the ability to retain the shape it was in before it left the sheep. The energy required to produce our insulation is less than 10% of that required to produce traditional insulation materials. Wool can absorb and breakdown indoor air pollutants such as formaldehyde, nitrogen dioxide, and sulfur dioxide. Wool is a sustainable and renewable resource; every year our sheep grow a new crop. Wool is completely recyclable; at the end of its life as insulation it can be remanufactured, reused, or biodegraded. Wool is an excellent absorption medium of sound waves; its inherent qualities provide much more acoustic insulation than traditional insulation in similar applications. While wool is generally fire resistant, our wool is treated with a 100% natural solution of organic materials that provide unequaled fire and vermin resistance. These materials are bonded chemically to the wool fiber, not merely “glued on” as in most other insulation products. Here's a pic of our bedroom ceiling going in. Because our ceiling rafters are not very big, we were limited on the type of insulation we could use. That is, we had to get the biggest R value (insulation measurement) in the smallest amount of space. We first sprayed a three to four-inch layer of Foam It Green insulation, which has an extremely high R rating. It accomplishes in two inches what traditional fiberglass insulation does in six to eight inches. Then, in the space remaining, we're stuffing in the wool fibers. 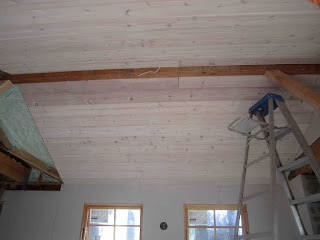 It's all done by hand and kept in place by the ceiling planks.